We are just over a week away from the start of the Cincinnati Fringe Festival, so it is time to start planning your schedule. I'll be giving some must-see shows I am recommending throughout the week. Please note that I haven't seen any of the shows in the festival. I've completed a vast three year research project that combined buzz, reputation of the producers/actors, and coffee to come upw with a short list of shows I am not going to miss. This means my knowledge should not be questioned and all theatre goers should head my advice. Or they could just see every show. 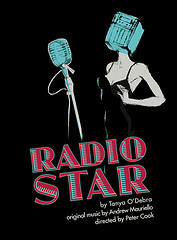 Today's show is Radio Star by Tanya O'Debra of NYC. Radio Star was voted Best of Fringe at the 2011 San Francisco Fringe Festival.